Vault of Light: Black Market auction house - Fiery Warhorse. 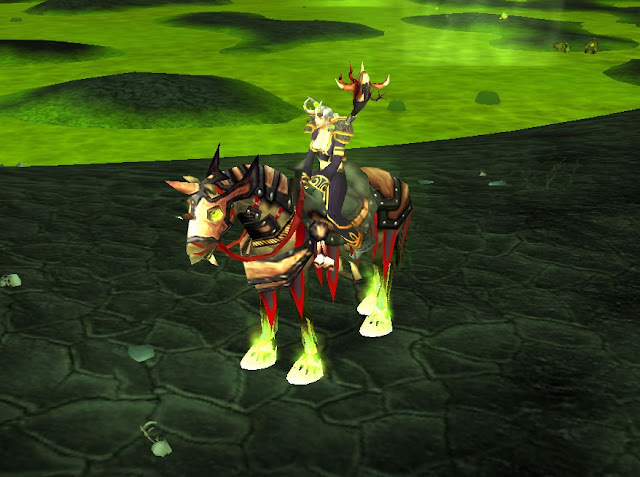 Black Market auction house - Fiery Warhorse. The Black Market Auction House got me again! I blogged two weeks ago about having bought myself an Onyxian Drake from the BMAH. This week a Fiery Warhorse showed up and I just couldn't resist the urge to bid on it. I decided pretty early on that I wasn't going to spend any more than 100k. I started to bid while it was on short (between 30 mins and 2 hours) and someone started to counter my bids! However I did notice that he had to keep running to the mailbox before placing another bid. My idea of limiting myself went out the window. I felt this fierce sense of competition. I wanted to win the auction no matter what. Betting that I likely had more gold than him we both kept bidding. Eventually he stopped and I won the mount for 95k. Boy was it exciting! 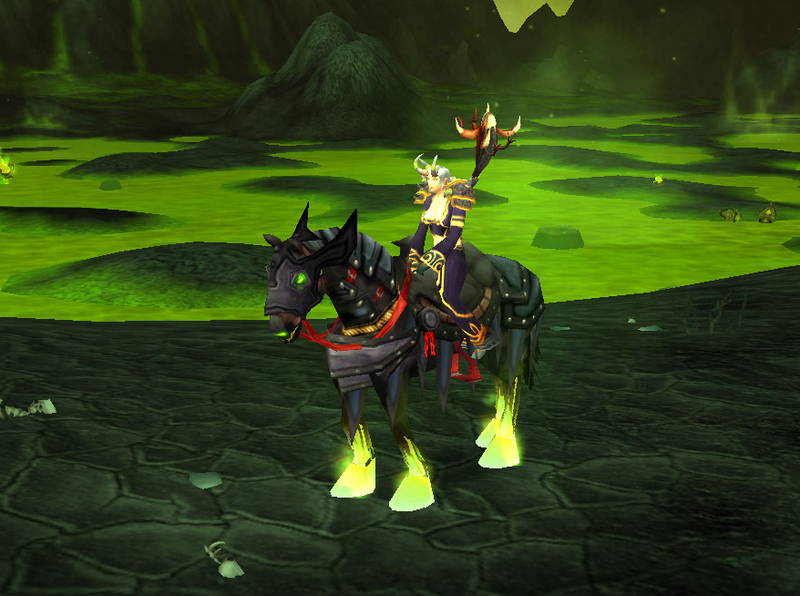 These are pretty much two perfect Warlock mounts which is I think why I've started to level mine. She's currently Eighty Eight but I've just ran out of rested xp so I'm going to take a break and focus on something else for a bit. Thank you! At the same time I was watching an auction for a pair of heroic 535 bracers that went for 250k! That seems like a crazy amount of gold to spend on an item that isn't a mount, to me at least. Thank you! =D I'm sure 95k seemed like a lot to me a while ago too! Grats so much. :) Totally worth it! gratz! I need to start reminding you to do your mount runs every week. If we keep reminding eachother, we can save some serious gold..... or can we?? Haha, that sounds like a fantastic idea! I'd also like for you to tell at me if I go near the BMAH! Grats! Ahhh, the thrill of the BMAH. It's like an addiction, I tells ya! Congrats. I feel like i get to spend gold vicariously through you.